Book Reviews and Promotions: Procrastinate and be MORE productive! If you want to be successful, or increase your general productivity then it is time you use procrastination to achieve this. You never thought your Procrastinating ability could do you any good. But truth be told, You don't need to bother yourself with getting rid of procrastination. Rather here is how you can procrastinate and still get task done while having overall fun. 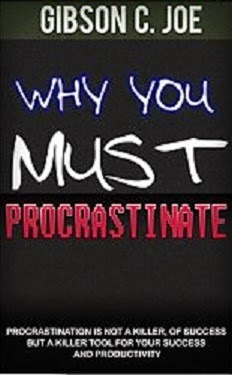 This book "Why you must procrastinate" has one aim, to help complete your task and achieve your desired success and still have the fun doing this things. It is a Short, practical and straight to the point book. The concept of this book is simply channeling procrastination to the right source and instead of it becoming a killer of your success and time, it becomes a killer tool for your success and productivity.